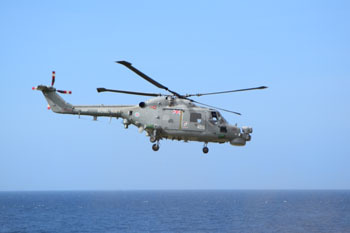 HMS Dragon visited Tristan on 30th January 2015. 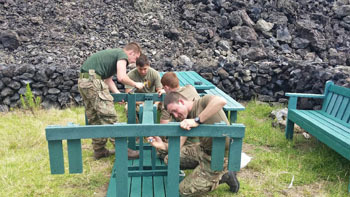 The crew helped islanders with various tasks and socialised. 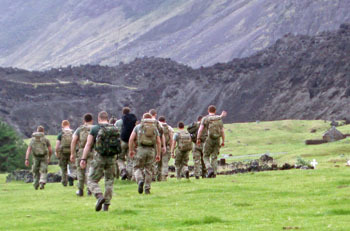 A party of Royal Marines hiked to The Ponds on The Base. 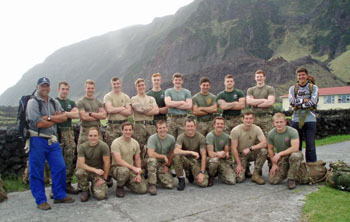 It was wonderful to be able to welcome Captain Rex Cox and crew of the HMS Dragon to Tristan on the morning of Friday 30th January. The Chief Islander, Police Officer and I were flown aboard the vessel for morning meetings, and tour with the Captain and crew before flying back at 11.00 for the events to start. 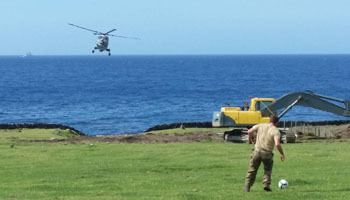 As ever the Royal Navy were keen to lend whatever support the island required and organised several Base drops of materials for the islanders, as well as delivering provisions and presents for the children, and even the ship’s doctor helping the Vet with an operation. 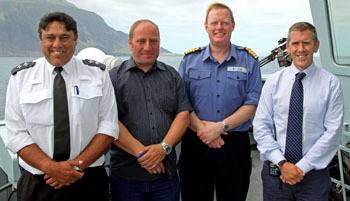 and Administrator Alex Mitham aboard the ship. 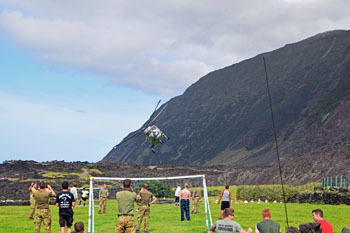 It was a glorious day with a hike to the Ponds arranged for a group of Royal Marines, tour of the island for Captain and even an impromptu football match. I would just like to take this opportunity to thank the captain and crew for their incredible generosity, hospitably and professionalism. 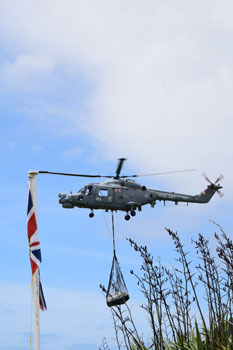 Once again the Royal Navy have provided much needed support (and enjoyment!) 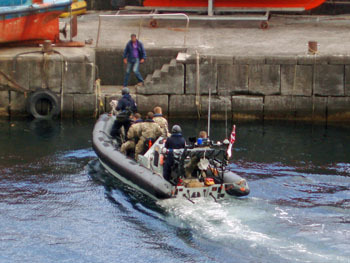 to the island, and we look forward to welcoming them back again in the near future. 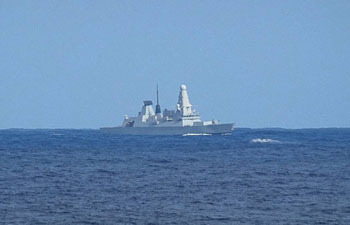 I just wish the weather gods had looked on us favourably and HMS Dragon could have stayed longer. I would also like to thank everyone who was involved in making the day such a success including Dawn for doing all the arrangements!, Erik, Julian and George for providing the local fish, Justin and Jerry for guiding the Royal Marines, (Marc and Robin for helping the Marines assemble the new benches), all the ladies who helped at the Reception, Andy for Communications, Lorraine for managing the provisions. 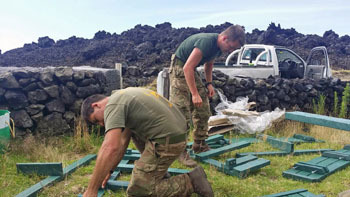 The Island has a long and very important military history – Not least from the founding of the community to the present day. 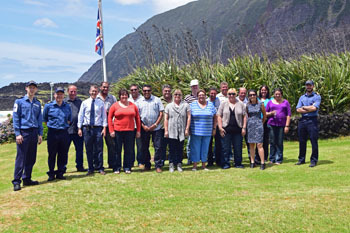 However - The Island has a special relationship with the Royal Navy as it has provided so much assistance to us over the years, in not only maintaining the harbour, but also providing an essential deterrent to illegal fishing. We are now able to use a new satellite tracking system to monitor any ship movements on a daily basis. This system now allows us to monitor all vessels which enter our EEZ and further action will be taken on any ships that are fishing illegally in our waters. 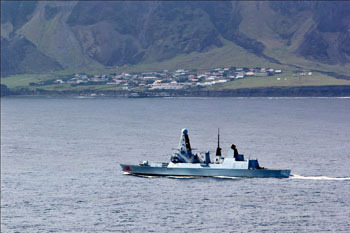 Combining our capabilities in tracking the vessels with the Royal Navy assets in the region should help to deter the illegal fishing trade. We now have the capabilities – and, we are watching. Below: The group assembling and setting off for a mountain walk to The Ponds. 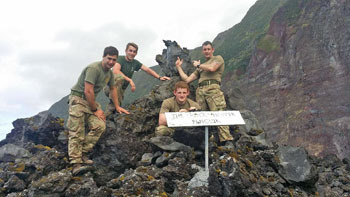 We really enjoyed HMS Dragon's visit. Unfortunately only about 25 people managed to land but it was still a great day. 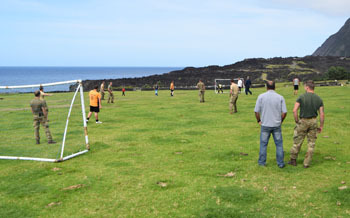 A group of Royal Marines went to the Ponds with local guides Jerry and Justin Green and on their return helped erect some picnic benches for the community and then enjoyed a game of football against Tristan Tigers, result Tigers 0 Marines 2. 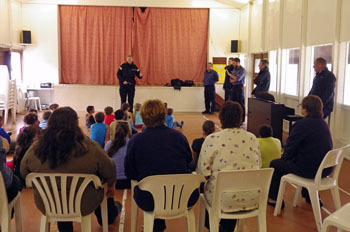 The Captain came ashore at about midday and visited St Mary's School to give a talk to the children and hand out some goodies. 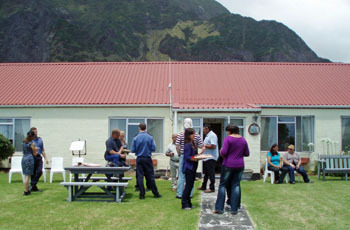 Following this he attended a reception by the Administrator at The Residency and was then given a tour of the island. 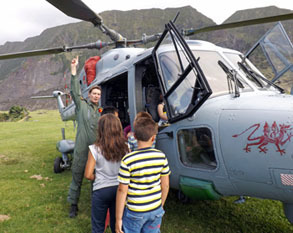 After the helicopter had completed the lifts to the mountain, they shut off engines so the children were allowed to visit. They so enjoyed looking around inside, definitely a highlight of the day.The last flight out was at 7pm and then the ship headed off for Cape Town. 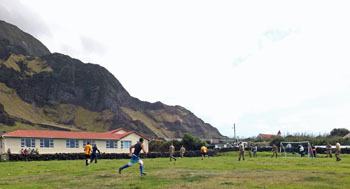 The American Fence serves as the school (and Tristan Tigers') playing field, a cow pasture and helipad! 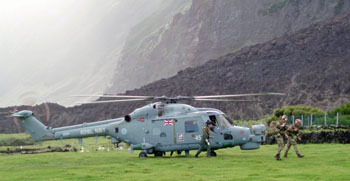 The helicopter may be too close for comfort, (above right and below) but at least the cows were elsewhere this day! 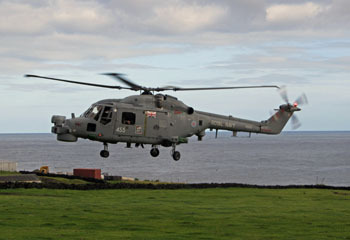 Left: School children get to sit in the helicopter. 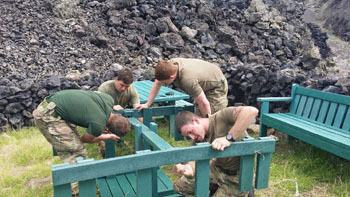 After returning from The Ponds, Royal Marines erected new picnic benches in 'Park 61' on the 1961 lava flow and are also shown below at the "Rock" Hopper Penguin (a naturally carved rock that looks like a penguin situated next to Park 61). 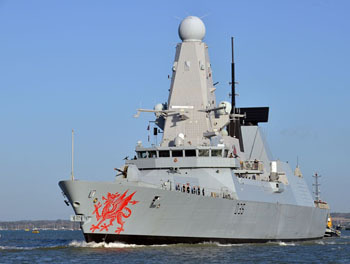 HMS Dragon is the fourth ship of the Type 45 or Daring-class air-defence destroyers built for the Royal Navy. 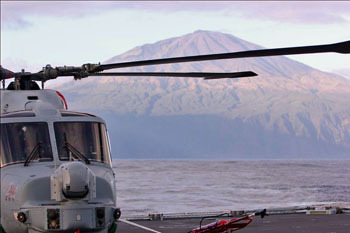 She was launched in November 2008 and commissioned on 20 April, 2012. The ship has a displacement of 8,000 tonnes, is 152.4 metres long and has a range of 13,000 kms at a speed of 18 knots (33 kph) but can exceed 29 knots (54 kph). The ship has a complement of 190. HMS Dragon left Portsmouth on 27th October 2014 for a routine seven-month Atlantic Patrol Tasking deployment, taking over from HMS Iron Duke to continue the UK’s commitment to the region building on the UK’s strong ties with its allies. 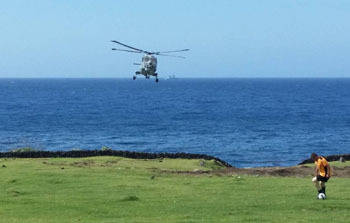 During her seven months away, Dragon will visit several ports in the South Atlantic and Pacific oceans as well as visiting a number of West African states to strengthen relationships. 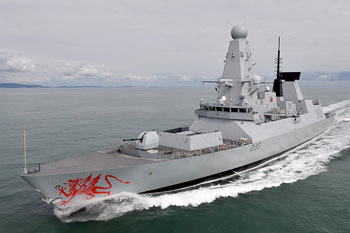 It is only the second-ever deployment for the warship, which returned from her maiden deployment in the Gulf in 2013..To mark the occasion, the fiercely-named Type 45 destroyer had a red dragon painted onto her bow, just as she did for her first ever entry to Portsmouth in 2011.